Using a quality natural anti aging moisturizer is a must to keep your skin youthful and healthy. Not only does a moisturizer keep the skin hydrated but it is an excellent way to nourish your skin making it strong and better equipped to fight those wrinkles! One of the most common complaints about aging skin is how dry it always is. Not only is our skin becoming more thin but it's oil production is also slowing down. Not using a good natural moisturizer leaves the skin dry causing skin tissue to shrivel therefore causing wrinkles.Add the fact that our collagen and elastin break down and disconnect with age causing sagging skin and it almost seems hopeless! What ingredients should be in a natural moisturizer to fight wrinkles? First of all when dealing with aging skin you should have a light but very hydrating moisturizer for during the day, and at night before bed you should always apply a heavier, more nourishing moisturizer. This allows your skin to take full advantage of all the nutrients while you rest with out added skin products like makeup. Avocado This ingredient does it all. It renews, regenerates, heals, tightens and moisturizes. Avocado is packed full of nutrients that aging skin loves! Aloe Vera You can't go wrong with aloe vera no matter what kind of skin you have. It soothes, heals and moisturizes plumping up skin and reducing the look of wrinkles. Carrot Seed Oil This ingredient should be in every anti aging moisturizer or any other anti aging treatment for that matter. Carrot seed oil is extremely nourishing to aging skin and improves your skin's elasticity. Coconut Oil Excellent for healing and moisturizing skin. Cocoa Butter Not only is cocoa butter an excellent moisturizer it also improves skin's elasticity. Comfrey This natural ingredient has healing and regenerating properties that are beneficial to aging skin. Cucumber Not only is cucumber good for puffy eyes but it is also good for wrinkles. Grape Seed Oil This oil is an excellent choice for any skin type. It is very light and absorbs very easily into the skin making it a good day time moisturizer. Jojoba Oil A very effective moisturizer that is little waxy but does not build up on your skin. Lavender Oil Lavender helps increase circulation to the surface of the skin which is very important to your skin's health. Healthy skin puts up a better fight against wrinkles. Mango Butter This excellent anti aging moisturizer is very high in essential fatty acids which are good for the treatment of wrinkles. Milk This simple natural ingredient is an amazing all in one skin care treatment. It not only exfoliates and cleanses, but moisturizes and regenerates your skin. Milk reduces the signs of aging very effectively. Olive Oil Olive oil moisturizes, regenerates and firms aging skin. Orange Oil This oil helps form collagen, increases circulation to skin and helps in cell regeneration. Papaya Like orange oil, papaya is very high in Vitamin C which helps build collagen and improves skin's texture. Rose Hip Oil High in essential fatty acids which moisturizes, regenerates and repairs aging skin. SandalWood Oil Smooths the appearance of skin, heals and balances skin's natural oils. Shea Butter Shea butter is an excellent anti aging moisturizer. It can be applied all on it's own for intense moisturizing. Seaweed Found in many anti aging products, seaweed smooths, softens and helps retain moisture in skin. Add a few drops of carrot seed essential oil to your regular moisturizer and wrinkles won't stand a chance! Incorporate these ingredients into your own anti aging skin care recipes or look for them in any natural skin moisturizing products. One thing is for certain. If you include these natural ingredients in your anti aging moisturizer, whether you make it yourself or purchase it, you will see a difference in your skin by giving it everything it needs to stay youthful and glowing! 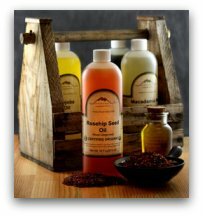 To purchase quality essential oils and other natural skin care ingredients visit Mountain Rose Herbs.